Shamrock Precision uses proven technology to craft products with challenging dimensions, tight tolerances and short lead times job-after-job, year-after-year. In order to achieve fast cycle times, we purposely invest in and maintain available capacity on critical equipment, tooling and material. With an eye toward the future, we evaluate new trends, technology and best practices available on the market. 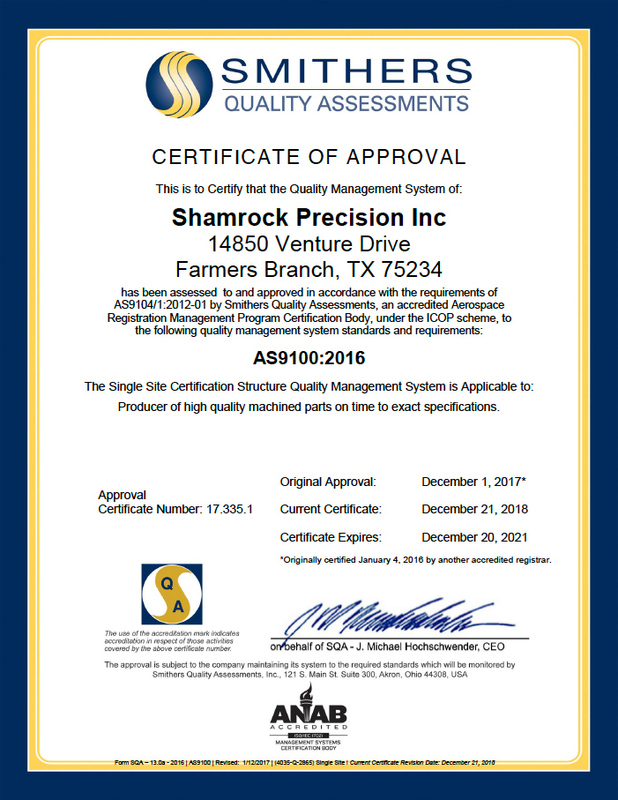 Shamrock Precision’s objective is to provide products which meet customer specifications, are delivered on time with continual improvement in our processes. Centerless grinding, heat-treating, plating, coating, anodizing and passivating are available to provide complete parts. 15" MAIN CHUCK, 13" DIA. 20" X 40" X 24"
20" X 40" X 20"
Sinker EDM, Wire EDM, Gun Drilling, Shot Peening, NDE Inspections, and more as requested. Shamrock Precision adheres to the highest quality standards in the manufacturing of its products. Standardized quality management system for the aerospace industry. Internationally recognized quality management system focused on meeting customer expectation and delivering customer satisfaction. Manufacturer’s declaration that supplied goods meets the required specifications and purchase order requirements. Quality assurance documentation that certifies a material’s chemical and physical properties and to which international standard. Quality assurance documentation that provide evidence that the parts shipped possess the chemical and physical properties required by the order specifications.